Mud-paint your face to deeply deliver skin-brightening extracts for instant light and lift. Help improve your skin`s appearance with antioxidant compound Vinanza, Grape and Kiwi. Prized peony also contributes to a bright and luminous visage by addressing uneven tone, while jojoba esters help shift deadened cells. Detox your skin with mineral-blessed volcanic mud from geothermal New Zealand, revered for it regenerative brilliance. This product is suited to most skin conditions, especially congested, dull and combination. 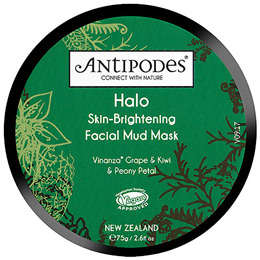 It is a deep cleansing product to complement the other products in Antipodes’ skin-brightening range. Aqua (water), kaolin, volcanic New Zealand mud, glycerine, propanediol (natural) , Simoondsia chinesis (jojoba) esters, zinc oxide, gluconolactone & sodium benzoate, magnesium aluminium silicate, butylene glycol, arbutin, citric acid, sodium sulphite, acetyl tyrosine, Saxifraga sarmentosa (strawberry begonia) extract, Paeonias suffruticosa (peony) root extract, aminopropyl ascorbyl phosphate, Scutellaria baicalenssi (skullcap) root extract, glutathione, dehydroacetic acid, benzyl alcohol, xanthan gum, Pongamia glabra (Indian beech) seed oil, Asteriscus graveolens (oxeye) flower extract, Persea gratissima (avocado) pear oil, coco-glucoside, Vinanza Grape & Kiwi (Vitis vinifera [grape] seed & Actinidia deliciosa [kiwi] fruit) extract, pure plant fragrance of vanilla, raspberry, wild berry & musk: benzyl salicylate*, citral*, citronellol*, geraniol*, d-Limonese*, linalool*. To achieve the best results, lavish a thick layer of this creamy mask over your cleansed face and neck, avoiding your eye area. Leave for 15 minutes, then rinse away thoroughly with warm water. Use twice a week. Store in a cool, dark place below 21°C. External use only and patch test first. In the unlikelihood of negative reaction discontinue use and consult a health practitioner. Any batch variations due to pure ingredients & environmental factors. Below are reviews of Antipodes Organic Halo Skin-Brightening Facial Mud Mask - 75g by bodykind customers. If you have tried this product we'd love to hear what you think so please leave a review. Help improve your skin`s appearance with antioxidant compound Vinanza, Grape and Kiwi. Prized peony also contributes to a bright and luminous visage by addressing uneven tone, while jojoba esters help shift deadened cells.